Google’s Chrome OS has evolved into a robust operating system with a niche focus. I have been using Chromebooks for a while now and this page is my collection of Chromebook tips. I regularly update this list, adding new tips as they are added to Chrome OS. If you are a new Chromebook user, this is the perfect place to start! Chromebooks are simple and fun to use. If you are a new Chromebook user, I have a guide, complete with a free PDF that you can download. Where is the Capslock Key? This is one of the first questions that new Chromebook users ask. That’s quite normal. There is no caps lock key on any Chromebook. Google decided to add a search key (and an Assistant key in newer Chromebooks) when they designed the Chrome OS keyboard layout. This does not mean that you cannot use caps lock on a Chromebook. The first method is to use the keyboard shortcut ALT + SEARCH This enables capslock on Chrome OS. You will see a notification in the notification area when caps lock is on. Another option is to permanently change the SEARCH key into caps lock key. If you take a closer look at your Chromebook’s keyboard layout, you will notice that along with the caps lock key, Home, End and Delete are missing too. Just like the caps lock key, you can use keyboard shortcuts for Home, End and Delete keys. Looking for more keyboard shortcuts? You can lock your Chromebook’s screen using the keyboard shortcut SEARCH + L. You can also use the lock icon next to the sign out button on the system tray. If you have apps pinned to your Chromebook’s taskbar, you can use this quick keyboard shortcut to open them. Use ALT + Number to do this. For example, if you have the Files app pinned to your taskbar as the second item, use ALT + 2 to launch the Files app. Now, let’s have some fun. CTRL + ALT + SHIFT + RELOAD will make your Chromebook do a barrel roll. It’s cool! Do not forget to try this next time you are showing off your Chromebook to friends. CTRL + Window Switcher key. Take a partial screenshot by selecting the area you want to capture, Ctrl+ SHIFT + Window Switcher key. There are more ways to take screenshots. Find them here. To open a command prompt, press CTRL + ALT+ T. Once you are on the command prompt, type shell and hit enter to go to the shell prompt. You can do a lot of things even when your Chromebook is offline. This is especially true if your Chromebook supports Google Play Store and you have Android apps installed. I have created a separate guide explaining how to use Chromebooks when you are offline. SHIFT + LAUNCHER (or SEARCH key) opens the launcher in full screen. If you press only the Search aka Launcher key, the launcher will open partially, at the bottom of the screen. Google Drive is available as an extension of the FIles app on your Chromebook. It works more like an additional drive. The Google Drive section can hold cached copies of your files. How do you refresh this cache? To refresh Google Drive cache, go to chrome://drive-internals/ and click “Clear local data” to clear cache. Changing your chromebook’s release channel, (software version) is a good idea if you want to experiment or check out new features waiting for general release. Chrome OS has stable channel which is without any experimental features and Beta and Dev channels which feature experimental features. To change channels, visit chrome://help and click More Info. You can switch channels here, and with one re-start, you will be on the new release channel you picked. To insert Unicode characters, press CTRL + U + The number for the unicode character. Once you are in the command prompt (CTRL + ALT + T ) you can do SSH using the following format. ssh username computernameORipaddress. To view available SSH options, type ssh hit enter, and then hit enter one more time. On an ARM Chromebook, Hold ESC + Refresh buttons then push power to enter developer mode. To view hardware information of your Chromebook while it is booting, press Ctrl + i or Tab + i. To view free space available on your Google Chromebook’s local drive (HDD or SSD) visit chrome://quota-internals/. Alternatively, you can click the gear icon on the Files app to view remaining space. To enable accessibility options on your Google Chromebook, visit chrome://settings/search#accessibility. You can enable the Accessibility menu, spoken feedback and other accessibility options. Enable tap dragging from settings (accessibility). Search “tap” dragging from the settings page. Press SHIFT + ALT + M to open the file manager. The file manager on Chrome OS is called the Files app. This app has an inbuilt audio player, video player and a picture viewer with basic editing options. Here is a comprehensive guide on the Files App in Chrome OS. While viewing pictures from the Chrome OS File Manager, (Files app) press E (as in Editor) to quickly edit the picture using the inbuilt image editor. If you are experiencing trouble with 3G or Wifi internet connection on your Google Chromebook, here is a way to start your diagnostic. Visit chrome://diagnostics and test your connection status. You can create a recovery media right from the Google Chromebook. You need a 4GB or larger USB flash drive or SD card. This card needs to be wiped completely so make sure you don’t have any data on it. Open up chrome://imageburner and follow onscreen instructions. To view the total amount of RAM, open chrome://system, find meminfo and click expand. To view the mac address of your device, go to Settings, search for Internet Connection. Now, click on the name of the network that you are currently connected to. A popup box with the network information will be displayed. The Hardware address listed there is the MAC address. Hold Shift key and click on any app to open it in a separate window,without the addressbar. This makes it look like an app, instead of a website!. You can right click any app to change the way they open by default, for example, full screen, new tab, new window etc. How to change MAC address of your Chromebook. To change the launcher/taskbar position, right-click the taskbar and go to Launcher position menu. A Simple Method to Upload Music to Google Play from a Chromebook. How To Add Locally Managed Users in Chrome OS. 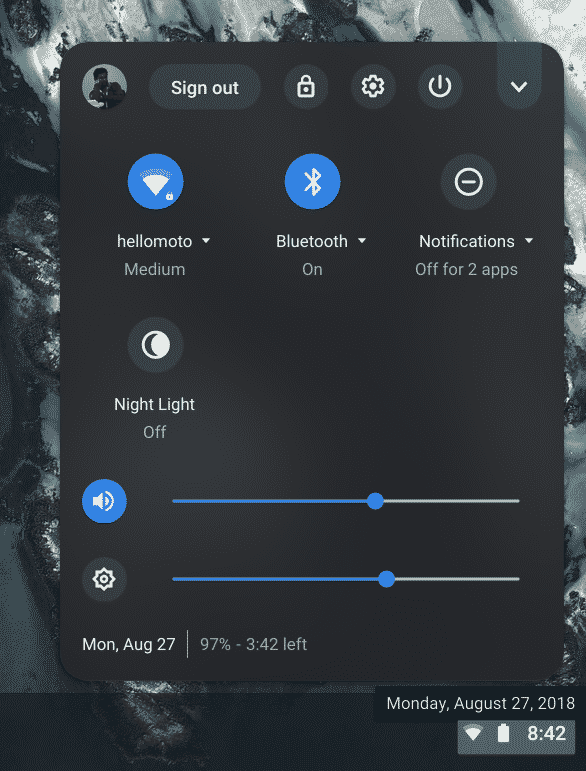 On the Status Area (The small pop up menu you get by clicking the time and profile icon on the bottom right corner of Chrome OS desktop) click the profile icon to easily access profile pic changing settings. On the file manager, right-click Downloads drive to see available space on your Chromebook’s HDD/SD. In Settings search for “Use High Contrast Mode” and enable to view Google Chrome OS in high resolution. If you try to open a .swf file (flash) from the Files app, you will get an error saying it is unsupported. Drag the file to a Chrome tab, and it will work fine! Do a Powerwash to Factory Reset your Chrome OS device. Looking for some help with Chrome OS File Manager? Its here. Looking for some additional security features for your Chromebook? here are 7 things you can do right now to make Chromebook secure. Accessibility options on Chrome OS, a guide. Keep pressing Alt + – (Alt Key and minus (-) to minimize each open window, till you see the desktop!. On HTML5 videos, this keyboard shortcut works as toggle between full-screen mode. To quickly get the IP address and MAC ID of your Google Chromebook, click the Ash Tray (the right end of your taskbar where time and your profile icon) and click the wifi icon, and then the “i” icon. You can access files present on the inbuilt Google Drive app from Chrome omnibar too. Open drive:drive/root/ followed by the file name. Note: it will not work without a file name. In Chrome OS, a hidden folder is actually a folder that starts with a dot like “.hidden_folder” for instance. By pressing <Ctrl> + “.” in the Files App, you can quickly toggle hidden folders visibility. It also works with files. To remove wallpaper images that you added through “Custom” section, right-click the image and select Delete. On the Chrome OS wallpaper picker screen, you can check “Surprise me” to see a random wallpaper each time you log in. You can rotate Chrome OS screen using this keyboard shortcut. <Ctrl> + <Shift> + <Refresh> . Try portrait mode now! The keyboard shortcut to rename a file in the Chrome OS Files app is CTRL + ENTER. A hard reset is one of the primary troubleshooting steps that you can try whenever there is an issue with your Chromebook. A hard reset will restart your Chromebook hardware, like the keyboard, touchpad, and battery. The reset won’t delete any files or settings from your Chromebook. On most of the Chromebooks, this can be done with REFRESH + POWER. Find more details here. <Shift> + [ ] (F4 or the full screen key) to make a packaged (native) app full screen. If you are on Developer Mode (not developer channel) you can force an update to Chrome OS by typing the following command in Chrome OS shell update_engine_client -update. If you have a Chromebook Pixel, you can play with the lightbar, control its colors and have fun! When you open the Message Center, press the red bell icon to pause notifications for a day. You can click the Android like clear notifications icon (those three lines!) to clear all notifications at once. By clicking the Play button or the video while holding <Ctrl>, the video will play in a looped mode. Pressing the <Ctrl> + <Shift> + 9 keyboard shortcut toggles the Projection Touch HUD. This is useful when you are doing a presentation on an external display, and wants to show your interactions with the touchscreen. If you want to disable touchscreen on your Chromebook, (read Pixel for now) chrome://flags and set the “Touch Events” flag to “Disabled”. Chrome OS has a MacOS like Exposé feature. Here, it is called the Overview Mode. This as the name suggests, gives you an overview of the open tabs and windows. You can access the overview mode with three finger swipe. Swipe from the top of the touchpad to the bottom. To switch the virtual keyboard layout, tap long on the keyboard icon to trigger the layout switcher overlay and pick the one you want among the hardcoded System QWERTY ¹ , QWERTY and Dvorak for now. Under keyboard settings, enable “Treat top-row keys as function keys” to get windows like function keys on your Chromeook. From settings, check “Enable stick keys” to perform keyboard shortcuts by typing even them sequentially in Chrome OS. In this mode, you can press and release a modifier key such as , or and have it remain active until any other key is pressed. Open chrome://power to display battery charge percentage over time. This page will be updated soon with more power/battery related information. While using Chromecast with a Chromebook (ie, casting from a Chromebook), you can close the lid without worrying about losing your content. Chrome OS considers Chromecast similar to an external display and continues to cast. Pressing <shift> while clicking on a Chrome Hosted App in the App Launcher opens it in a window instead of a regular tab by default. On the Camera app, type CRAZYPONY (in caps) to make it a video player and take funny screenshots of the video. You can do a Power Wash and reset your Chromebook without logging in the device. This is useful if you ever get locked out of a Chromebook. At the first login screen, press Alt+Ctrl+Shift+R and tap the Restart button. If you have the “Multi Profile” mode enabled, click the drop down arrow on the profile icon on the login screen to choose another account. For a split-screen effect, you can dock a window to the left or right. Click and hold the maximize icon, you will see two arrows, one pointing to the left and the other to the right. Use these to dock the window to the right or left. You can also use the shortcut ALT + [ to dock left, or ALT + ] to dock right. You can right-click any folder inside your Google Drive account and create a shortcut for easy access. You can do this for your sub-folders too, which makes this feature even more useful. If you have a folder that you frequently access, but is a couple of levels deep (like I do most of the times; Documents > Home > Bills > April, that kind of stuff) this is going to help you a lot. Just right click any Google Drive folder from the sidebar of Files app, and select “Create Shortcut”. The Files app displays your storage media as separate drives. You can use memory cards, USB drives and external hard drives and even Android phones. What’s the one thing that you remember doing while removing such external media from your computer? Safely ejecting before removing them. On the Files app, use the keyboard shortcut CTRL + SHIFT + E to eject a removable device. Do you have a touchscreen Chromebook? Nice! What if you want to turn off the touchscreen occasionally and use just the keyboard and the touchpad? You can do this with a keyboard shortcut. Turn on/off the touch screen using this keyboard shortcut: SEARCH + SHIFT + T.
While connecting any device using Bluetooth, it is important to be able to identify the device by its name. To change your Chromebook’s Bluetooth device name, open a Chrome OS Shell with [CTRL] + [ALT] + T, type bt_console and go to Bluetooth Console. Enter “system-alias <deviceName>” where <deviceName> is the new device name. On the Chrome OS audio player, use SPACE + K to pause / play music. Use Down/Up or Left/Right to Rewind/Forward min(5s, 10% of the duration) and J/L => Rewind/Forward min(10s, 20% of the duration). Use the keyboard shortcut CTRL + SHIFT + along with + or – to increase or decrease screen resolution on your Chromebook. Instant tethering helps you connect to your phone’s WiFi hotspot with one click. SHIFT + SEARCH will open the launcher in full screen, or the entire launcher in Chrome OS. And of course, follow the latest Chromebook news and tips here! Hope you learned a thing or two here. Please do share this resource with your friends and fellow Chromies! Thanks, everyone who shared these tips on various forums and communities. A big thank you to François Beaufort and all my Google Plus friends!